With nearly 1,700 exhibitors and 72,500 visitors from 202 countries in 2013, Mobile World Congress has confirmed its reputation as the world’s largest mobile technology fair. If you’re a part of the communications industry, you won’t want to miss it. Join us in Barcelona to be part of Creating What’s NEXT. 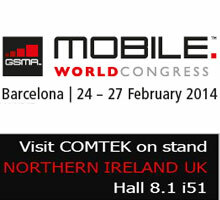 Comtek are represented on the Northern Ireland, UK stand i51 in Hall8.1. We look forward to meeting both new and existing customers. If you are attending the event please visit Planet App Hall 8.1 and engage us on stand i51. John Mitchell on +44 77 205 07 205 or send an email.